This cocoa nib semifreddo might be the easiest fancy dessert I’ve ever made. 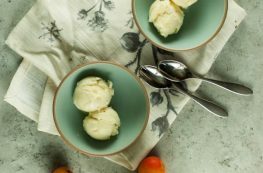 It has three ingredients (well, four if you count the pinch of salt), it requires about 10 minutes of active work, and it doesn’t require any special equipment like an ice cream maker–you just need some kind of mixing apparatus (anything from a stand mixer to a handheld mixer to a whisk) and a standard loaf pan. You also need a little bit of patience. 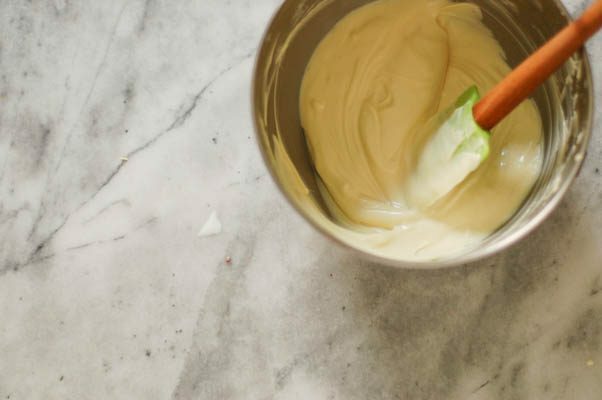 This is incredibly easy (if you’ve ever whipped cream you can definitely handle this), but it isn’t quick. It needs to chill in the refrigerator overnight and then freeze for another five or six hours at least. I’ve discovered there are many recipes including no-knead brioche and 36-hour chocolate chip cookies that let time do the heavy lifting for you. These slow and easy recipes are some of my favorites. They require a little bit of planning ahead, but the payoff for the work involved is tremendous. 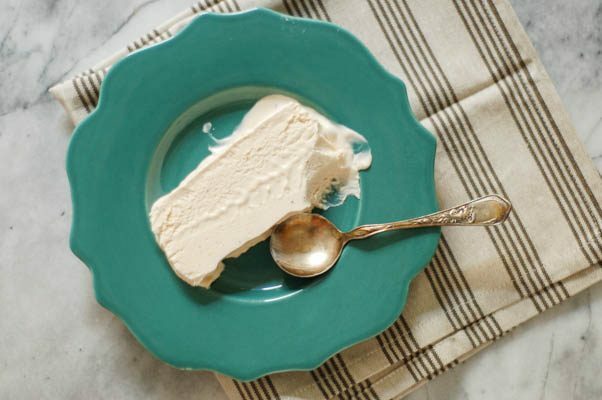 It’s a rich, creamy dessert that’s similar to ice cream but with a softer and lighter texture. It’s tough to admit this, but I might even like it better than ice cream. It is sweetened and stiffened with white chocolate. 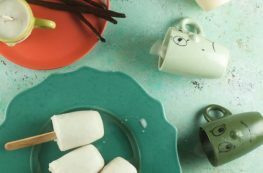 The resulting flavor is a delicate whisper of chocolate that reminds me a little bit of a classed-up frosty. 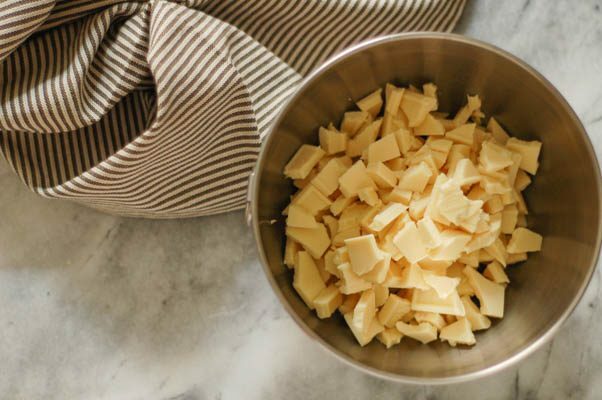 White chocolate gets chopped up and placed in a heat safe bowl. The cocoa nibs and a pinch of salt get added to the cream in a sauce pan and brought just to a boil. Then the saucepan is removed from the heat, and the bowl of white chocolate is set over it to melt the chocolate while the cocoa nibs steep in the cream for about 20 minutes. Then the cocoa nibs are strained out and the warm infused cream is poured over the melted white chocolate. The whole thing is whisked together until it’s smooth, and then it goes into the refrigerator to chill overnight. 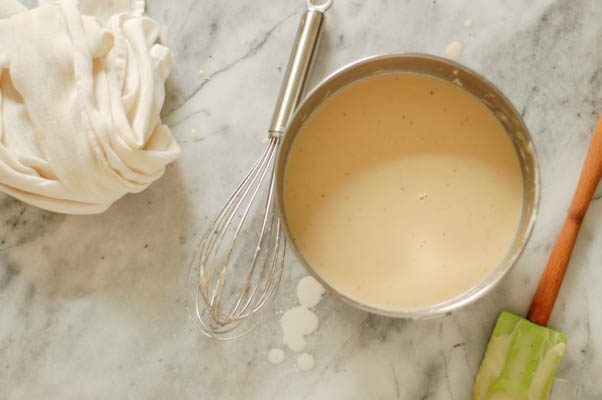 The next day, the mixture gets whipped into a fluffy mass and poured into a wax paper lined loaf pan which goes into the freezer until it’s firm enough to slice without losing its shape. (That takes at least five hours and it’s probably safer to allow for at least eight hours or overnight). Then just before serving, the whole thing comes out of the loaf pan and is ready to be sliced and plated. This is the sort of dessert that would be perfect for a dinner party, because it can be made ahead of time and hang out in the freezer until you’re ready for it. If you want to make it extra fancy, you could add some raspberries or a drizzle of chocolate sauce to the plate, but I don’t think it needs any of that. This is one of those desserts that’s pretty much perfect as it is. This semifreddo is made from just three ingredients: cocoa nibs, white chocolate, and heavy cream (plus a pinch of salt). I think of the combination of the cocoa nibs and the white chocolate and cream as a sort of deconstructed-reconstructed milk chocolate. This semifreddo is my own creation, but I credit Alice Medrich’s excellent chocolate book Bittersweet with inspiring me to play around with ingredients like cocoa nibs in the first place. Medrich got me thinking about using the nibs to infuse whipped cream and got me thinking about a new approach to chocolate in general. 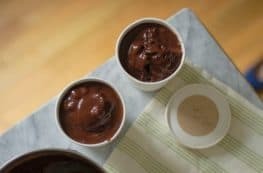 (Medrich is my chocolate guru, and I’d recommend any of her books, including Sinfully Easy Delicious Desserts for anyone looking for new dessert ideas.) Cocoa nibs, sometimes called cacao nibs, are available at higher end grocery stores like Whole Foods. They’re also available online. 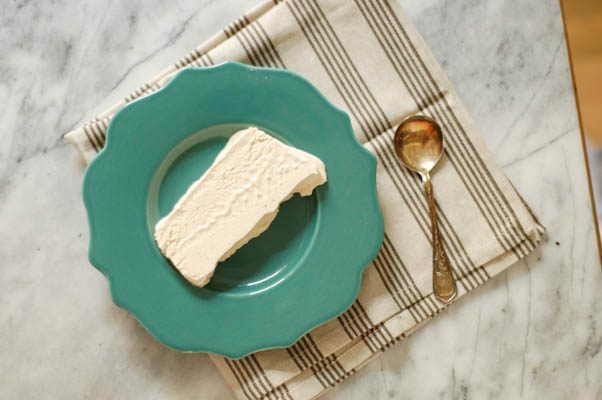 Semifreddo is a sort of frozen mousse, like ice cream with a lighter texture. 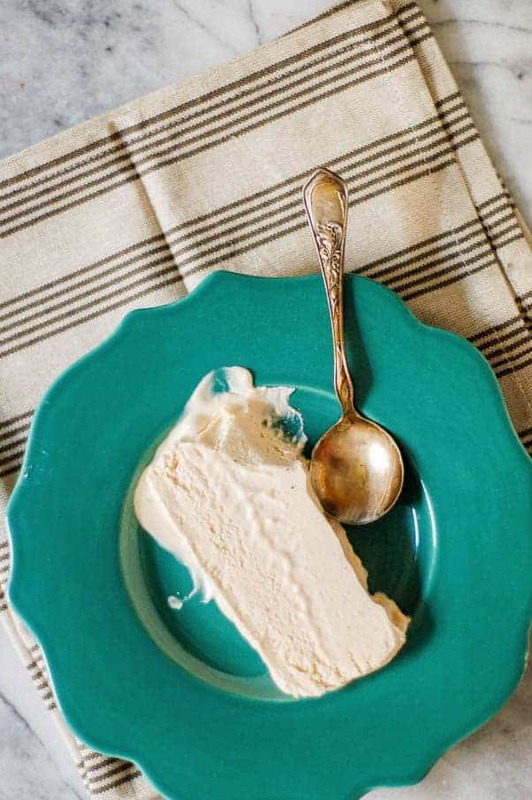 Unlike ice cream, it’s whipped before it is frozen, and it doesn’t require any churning in an ice cream maker. I used a stand mixer to make this, but a hand mixer will definitely work here. You could even whip it by hand with a whisk for a little upper body workout. 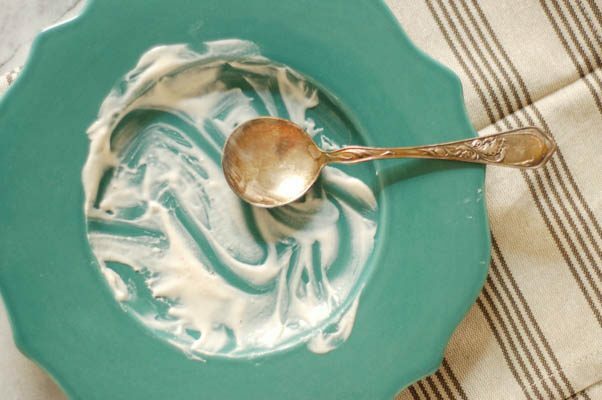 Just be sure to transfer it into a large bowl before whipping to allow for the increase in volume. Place the chopped chocolate in a medium heat safe bowl. 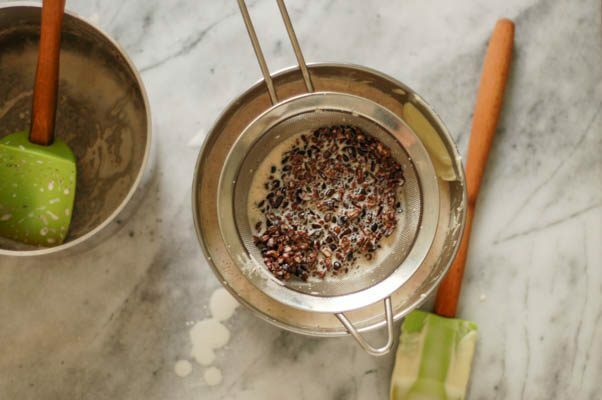 Place the cocoa nibs, heavy cream, and salt in a sauce pan over medium heat. Bring just to a boil and remove from heat. 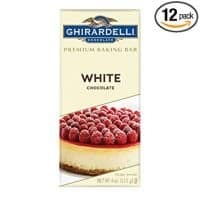 Place the bowl of white chocolate over the sauce pan (it should rest about the cream, like a double boiler–if you don’t have a bowl the right size to sit on your sauce pan, you can cover the sauce pan with a lid, and melt the white chocolate in 30 second bursts in the microwave). Let the cream and cocoa nibs steep for 20 minutes while the white chocolate melts. Pour the cream mixture through a fine strainer over the white chocolate. 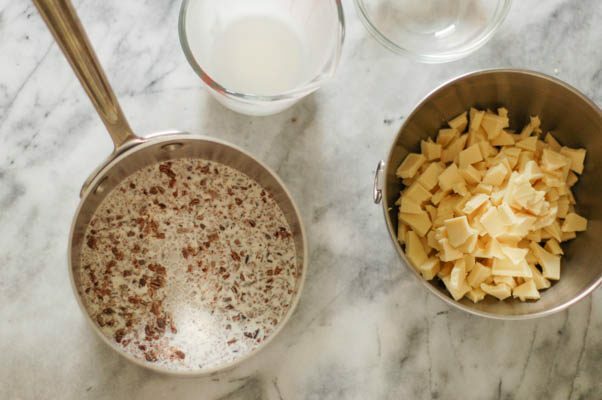 Discard the cocoa nibs and whisk the white chocolate and cream together until smooth. Let cool, then cover and chill in the refrigerator overnight. The next day, remove the mixture from the refrigerator. Transfer it to the bowl of a stand mixer fitted with a whisk attachment (or to a large bowl and use a hand mixer). Mix on medium speed until it holds soft peaks. 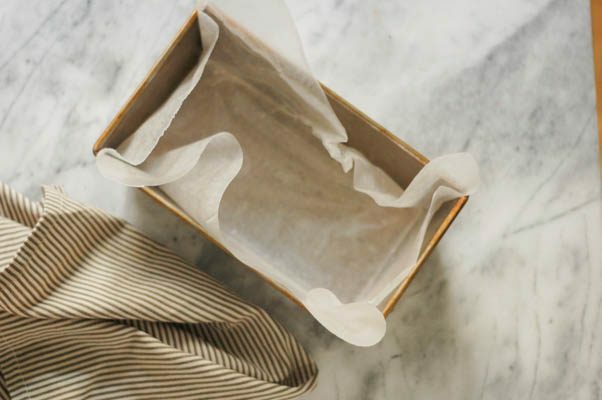 Line a standard loaf pan with wax paper and pour the whipped mixture into it, smoothing out the top with a spatula. Freeze until firm enough to slice. At least five hours, preferably eight or more. 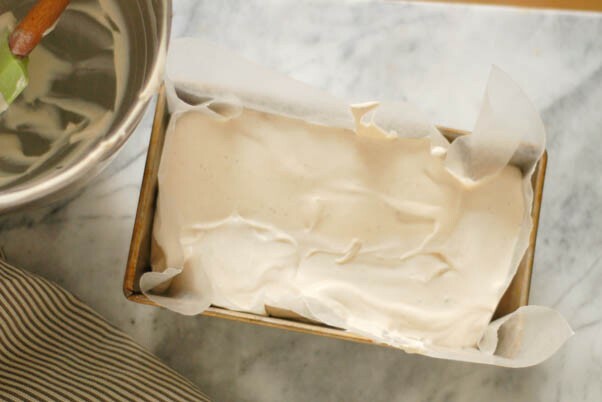 When ready to serve, remove the semifreddo, wax paper and all, from the loaf pan and place on a cutting board. Slice with a sharp knife. Serve.